Daytona and Crazy Taxi music… on the Master System! I jumped onto YouTube to look up some Master System music and came across these three examples of awesomeness from otobeya. Yes, I’m still here 🙂 A busy January has kept me from jumping back in, so let’s see how February goes. It also means my favourite blogs (all linked on the right) have had multiple updates I need to catch up on. In thinking how to start off this year I thought about setting goals and how that plays into my gaming habits. I often overwhelm my spare time with a multitude of things, some of which is productive, some of which isn’t. Taking on big projects should be done accordingly, without going overboard. Catch up on some tutes – I have stacks of photos from some Mega Drive 2 mods (including doing the colour mod), Famicom AV mod tute, Saturn Virtua Gun button repair mod and probably a few others I’ve forgotten. Start posting up gaming session images using the video capture thingie I bought ages back. Make some video tutes showing how to hack Phantasy Star: Generation 1 and Generation 2 on the PS2. Play through Phantasy Star 2 in Easy Mode on the Sega Ages Phantasy Star Collection on the PS2. Catch up on downloadable titles on PSN/XBLA. Play more old games, especially Famicom stuff. Finish my Famicom mod (need to swap in a fresh transcoder) and fix the controllers. Replace the dead cart slot in my Saturn. Rebuild my gutted Taito Space Invaders cocktail cabinet that’s been gutted and sitting idle for well over 12 months. Finally build the huge switchbox I’ve been wanting to assemble for a few years now. Fellow retro gamer Frank might have convinced me to look into getting a Twin Fami owing to its amazing composite video output; will definitely consider it if the composite video mod on my Famicom doesn’t look comparable. There’s nothing more country and masculine than chucking a beachie in Whyalla. Especially when listening to chiptunes. Specifically the PSG chiptunes from Wonderboy 3 on the Master System. As the generations moved on, redbook audio meant it was a little easier to get your video game music on the fly, and of course we’re now in a world where we have direct access to imported OSTs from Japan and my phone doubles as a media player. So, it was a wonderful mix of old and new last weekend – listening to Wonderboy 3 via an iPhone in a car whilst doing laps of the local haunts. All for no reason. Seasonal gaming habits – spring? So, it’s hitting spring around here (remember, this is the southern hemisphere ;)). This means it’s no longer cold (“cold” by Australian standards anyway), the garden comes alive (with new weeds and the lawn needs more frequent mowing), it’s brighter for longer and Christmas isn’t too far away (scary). Last year I wrote on how games are associated with my memories of different seasons. It’s completely irrational, but for me different seasons have tangible memories of gaming associated with them. So when the seasons change, it makes me think of different games. As opposed to something more logical/socially acceptable, like music, movies or first loves. Popular culture informs me these associations are acceptable. They’re probably right. So, looking at the list above I thought I’d focus on the Mega CD games, because I have unusually vivid memories of the Mega CD. According to the Australian Video Game Magazine Score Archive at Retro Gaming Australia, Sonic CD was reviewed by Hyper in January 1994; this puts local availability anywhere from December 1993 to March 1994. The date is relevant because the first time I ever saw a Mega CD, in the flesh, was in my local favourite (and now sadly defunct) game store. Sitting on the front counter at the end of the two ailes full of Mega Drive and SNES games for rent that made up the small store (along with some Gameboy, Master System, NES and 3DO games to mix things up) was a Model 1 Mega Drive/Model 1 Mega CD combo with the opening splash screen/intro movie for Sonic CD running on a continuous loop. It was earth-shatteringly mindblowing in a way that you couldn’t imagine unless you were 12 years old and it was 1994. Unfortunately this isn’t necessarily a case for quality, as back in 1994 East 17 was popular amongst 12 year olds and digitised graphics/Mark Hamil was the future of gaming. So, enthused by the promise of CD-ROM technology and low-resolution video in 64 colours, I pooled enough money to be able to rent a Mega CD from said local independent for a weekend with Thunderhawk and Sonic CD to test the machine out. This happened to be in September, and I can still recall hooking up that extra power brick to the series of double adapters behind the laminate-woodgrain TV in the lounge room to experience the future. 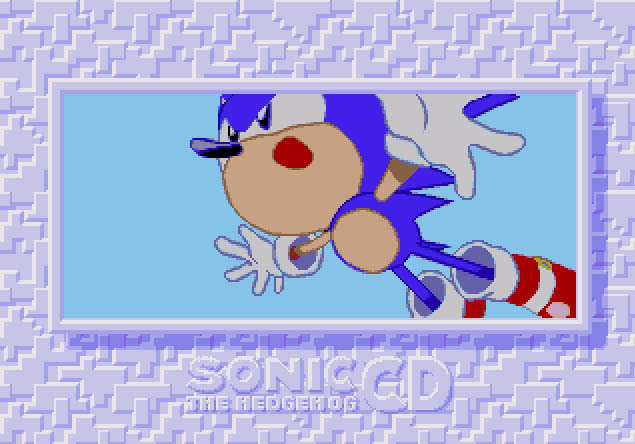 Sonic CD proved a great platformer in its own right, but the combination of CD audio (being a PAL version we had the original Japanese soundtrack, which is still my preference to this day) and 3D special stages elevated it to something else. Even if they could probably be done on a SNES with an overlcocked SuperFX2. Then came Core Design’s technical wonder of a game, Thunderhawk. Having spent many hours enjoying the glorious glory that was LHX Attack Chopper on our mighty 386DX40 PC (which became an even better game when I worked out you could copy the disk’s contents to the 40mb [!] HDD for faster loading), loading up Thunderhawk was all types of awesome. Great scrolling, amazing audio, and more detail compared to my previous flat-shaded shoot-shoot-helicopter experience with the former (not surprising given it was made in… 1990, compared to Thunderhawk, which was released in 1993). Thunderhawk would mark the start of a great relationship between Core Design and Sega that culminated with Tomb Raider launching first on the Saturn, whereupon Core sold out since Sony paid them a lot of money to go exclusive. Since Sega had very little money in 1996 and created a convoluted (but loveable) mess of hardware, this arrangement is not terribly surprising. But I digress – back to the story. To be honest, I thought that was going to be the end of my Mega CD experience as the add-on was expensive, so there wasn’t much possibility of being able to pick one up on pocket money and money gifting on birthdays or Christmas. Fast-forward a little over 12 months though, and things changed. With the release of the Saturn and Playstation in 1995, the upcoming Nintendo 64 (though I think we were still calling it the Ultra 64 at that stage), the tanking of the Mega CD and 32X and with the 16-bit era on its last legs (nobody told Nintendo, so we got Donky Kong Country, Secret of Evermore and in the US, Chrono Trigger to keep us entertained for a little longer), in 1995 the impossible became altogether possible. I’m not sure how I got the funds together, but I joined the Mega CD club in spring ’95. I probably have the receipt somewhere that’ll give the exact date too. Mum was kind enough to pick up the console and a game (Sonic CD) while I was at school, but it was a modern day/1995 tragedy – I was behind on a geography assignment that was due the next day (a Friday if I recall correctly), so instead of unboxing my shiny new console I stole quick glances at it between burying my head in atlases and encyclopedias whilst trying to write something coherent. Roll on the next day though, and after school it was Mega CD time. It was warm (so I’m guessing it was late-October or November), so the fan was buzzing away at the lowest speed, and the Mega Drive + Mega CD 2 combo was hooked up via RF to the recently-acquired 34cm TV (in fashionable late-80s matte black, a hand-me-down from my older brother who replaced the TV [and accompanying C64] with a 14″ SVGA monitor and the 386DX40). Packed in was Road Avenger, which received a cursory play, but the real meat was Sonic CD. I can’t tell you how many hours I sunk into that game in the months following, but it was a lot. I remember unlocking everything on that game, it was amazing. I even started playing Road Avenger after a while, and began to genuinely enjoy it. This last point is not surprising in the context of 1995/1996, as my burgeoning anime interest was about to ramp up following easier access to videos thanks to Siren/Manga Video and SBS kicking off things with Ninja Scroll on Des Mangan’s Cult Movie sessions on Saturday nights a few months later. You’re a collector now. Be proud. Now that first console is just one part of a mammoth collection that consumes your house. Somewhere among the countless games, consoles and peripherals is that first machine you ever picked up, that one that made you feel as though you’d crossed some great boundary, discovered some long hidden gem. For me, that first console was the Sega Master System in… ’98 or ’99. I was lucky enough to have an SMS in the early 90s, and when my brothers and I wanted to upgrade to the Mega Drive we sold the SMS2, accessories and all our games to cover the cost of the upgrade. By ’98/’99 I was able to drive, so I started hitting up the local video rental stores and my favourite local independent gaming store to see what they had around. I missed out on some gems at one of the video rental stores where they were getting rid of boxed titles for $2 a pop (including Ys III! ), though I still managed to grab a few oldies. My local independent was amazing though – bought up most of the stuff on the shelf and he rummaged around the back to find some other great classics (including a very clean boxed copy of Phantasy Star!). The Master System was the only system I ever sold to fund the next round of gaming. Since the Sega Mega Drive I’ve kept all the systems and most of the games as one generation transitioned into the next. I’m a shocker of a hoarder, but it pleases me that there others out there who have the bug worse than I!